The history of Pack 29 goes back to March 29th, 1949 when the I.O.O.F. 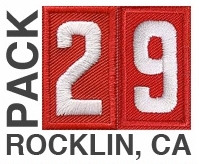 Rocklin Lodge #337 applied for a pack charter. When Noble Grand Harvey Daniels signed the charter application on that date, he set into motion a youth organization that still serves the families of Rocklin today. Little did Minnie Frkovich and Lucille Stollj (the first "den mothers") realize that they, along with Manuel Carreras, the first Cubmaster, would be starting such a successful pack. From a beginning of 23 youths and 7 adults in 1949, the pack roster grew to 62 boys and 26 adults in 1979. Enrollment slowed in the mid-80s, but rose again due to the popularity of the scouting movement and the growth of Rocklin. As of March 2006, Pack 29 has 81 boys in 11 dens, with 23 registered leaders and numerous other parent volunteers. As Rocklin has grown, Pack 29 also spawned several other packs to accommodate the interest in Cub Scouting. Different Rocklin community organizations have carried on the charter from the IOOF. Records reveal that in July 1957 the charter switched to the Rocklin Lions Club. Another change occurred in November 1964 when the Rocklin Parent Teacher Club was given the charter. It was probably in January of 1971 that the Rotary Club of Sunset, now known as the Rocklin Rotary Club, agreed to become the chartering organization. Sometime in the early 90's the charter moved to the Rocklin Kiwanis Club. As of 2006, our charter organization is the Rocklin Lions Club. Pack 29 has participated in many Scout-O-Ramas, camporees, day camps, and summer camps at Pahatsi and Winton. Honors have been received for participation in these activities plus recognition as a "national honor unit" in 1980. For many years running, Pack 29 has achieved the national Summertime Activity award for a year-round program. Even though it has been over 69 years since Pack 29 was founded, the official Golden Empire Council record shows only 53 years of consecutive service. Sometime before 1965, there was a brief lapse which "reset the clock". Nonetheless, through the 65+ years of Pack 29, thousands of boys and hundreds of adult volunteers have participated in Cub Scouts, one of the world's greatest youth movements ... a movement that helps develop character, provides citizenship training, and promotes physical and mental fitness. In 2018 there were big changes for the Cub Scout Program. After many years the BSA started the Family Scouting program that accepted girls into Cub Scouting. Pack 29 became an early adopter pack and was one of the first two packs in the Golden Empire Council to start the Family Scouting program. Pack activities have grown to include service projects, a highly successful pancake breakfast previously held during the Rocklin Jubilee now during Hot Chilli Cool Cars event, and the BSA national Scouting for Food drive. The pack conducts a very popular pinewood derby each year, a family campout, a raingutter regatta or space derby, and bike rodeo as part of the summertime functions. In past decades, the pack had difficulty establishing a permanent location in which to hold pack meetings. In mid-1990, several committee members met with the Rocklin Parks and Recreation Commission and obtained approval to use the Rocklin Community Center where we still meet today.